Not having a job changes you. You have to think differently when you're finding ways to carve out a life through words. For a long time, I wrote so that I could discover myself. Once I discovered myself, I wrote so that I could discover other people. Then my writing became something I did when I was not teaching. Now that I am not teaching, it is as if I have been catapulted back to that original locus of creativity. You have to think differently to make money as a writer. You can't think, OK, I make this much money a month, and I need to budget accordingly. No, you have to think, how much do I have to work this month? It's a paradigm shift for me. I feel both exhilarated and terrified. The first time I made money as a writer was when I was twenty-seven years old. I won one hundred dollars in a poetry contest. I never cashed the cheque. I lost it in a gay bar in New Orleans. The first job I ever had was a page at the local library in Mandeville, the town in Louisiana I lived in when I was in high school. I shelved books, and when I thought the librarians weren't looking, I read them. It was a revelation to me that I could actually earn money by putting away the books people read for free. It felt wrong that I made money being around books. I had volunteered at the library the previous Summer doing the same job, so the shift from kid-who-shelves-books-for-free to wage page was significant. It did not help that I hid my reading habits from my family (which led to many search parties). I also was ferociously protective of my writing journal, and it was an unpleasant experience to let anyone read out loud what I had written. These facts conspired against me. I think it took me a long time to grow into the role of writer, or maybe it has taken me a long time to connect loving what you do with making money for it. When I was a kid, a job was something you did so you could buy something awesome, like a bike, or a ticket to the movie theater. Not that I made a lot of money as a page or as a busboy (I did that too), but I didn't have to pay off a mortgage, or buy groceries. I remember the first thing I bought with my money. It was a Canon AP810 electronic typewriter that I bought for seventy-five dollars at a used office supply store off of Airline Highway in Metairie. The typewriter was heavy, and it overshadowed the surface of my desk. Maybe I got it with both wages from the library and the lump sum I used to get from Christmas and Birthday cash prizes. I don't remember the details. 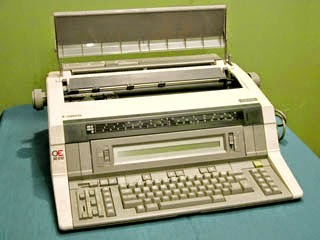 I wrote stories and poems on that thing, typed out on thin sheets of onion skin paper. It's somewhat of a family memory now. When I was home last Christmas, my younger brother gave my niece an old typewriter, but I don't think she types on it much. They showed it to me. It's in the garage. It's one of those portable models that require heavy pounding to extract any ink from the ideas in your head. Figures. There was a moment, as a teenager, that I thought I'd be a writer. Dole out wisdom like a mensch. Buy a house with exposed brick, have an open study where my friends would join me for tea. I think I had conflated images of Goodbye, Mr. Chips with sentiments from the New Testament because I joined the seminary. I had writer, priest, and teacher all jumbled up in my head. The best part about going away to the seminary was praising the Lord in an old car I bought for less than five hundred dollars: a 1989 Hyundai Excel hatchback. The seminary was secluded on a twelve hundred acre wood, so it was a luxury to have wheels to escape. Unfortunately, freedom was short-lived. The hatchback died on a Wal-Mart run one Friday night after Vespers. The seminarians who were with me: we had to push the clunker back to the seminary. It was an ole heave-ho. It was a wild night for a bunch of celibates. Now that I am unemployed and call myself a freelance writer, I have to actually write. And frankly, I'm terrified. But, it's a good thing. I lost my adjunct teaching job in February, and I have tried to do other non-writing stuff. March and April have brought me back to my electronic typewriter. Last year, when I was making ends meet teaching the Socratic Method to at-risk students in downtown Brooklyn, I bought a Brother electronic typewriter at the Best Buy near Times Square. I use it to type postcards to send to friends. I recently had a job interview to be a homework tutor at a branch library in the Bronx. They need tutors to help kids with their homework. I think I'd be good at it, but really I think what motivated me to go in for the interview was simply that I'm scared that if I don't have some kind of non-writing job I'll end up dumpster diving for food off the Major Degan Expressway. Maybe it's fodder for an aesthetic experience (or, that I just like to help people learn). I don't know if I'll get the job or not, but it would be a nice way to spend six hours a week in the Bronx. When I lost my teaching job I thought it was because I wasn't a good teacher. But that wasn't it. I'm a pretty darn good teacher. I was just teaching in the wrong place. And it showed. When you work somewhere you don't like, you either quit, or you get fired. It's the first time in my life since I was sixteen years old, tapping away on that old electronic typewriter, that I have cleared my head to write. I think it was Walker Percy who said you can't do both. You either teach or you write. Choose one. Or, maybe it does not have to be such a painful dichotomy. I think for me, the way I want to look at it going forward, is to see whatever I do, as motivation to carve out a life through words. Whether it's teaching children the Pythagorean Theorem or sussing out a quote for a three hundred word blog post, my new mantra is not yet defined, but I am sure Heraclitus is my patron saint: "You cannot step in the same river twice."